My little guy loves dinosaurs! That is the theme of his toddler bedding, and he even has quite a few dinosaur t-shirts and toys. My son also happens to love music, and is really mastering naming his colors and building with his blocks. 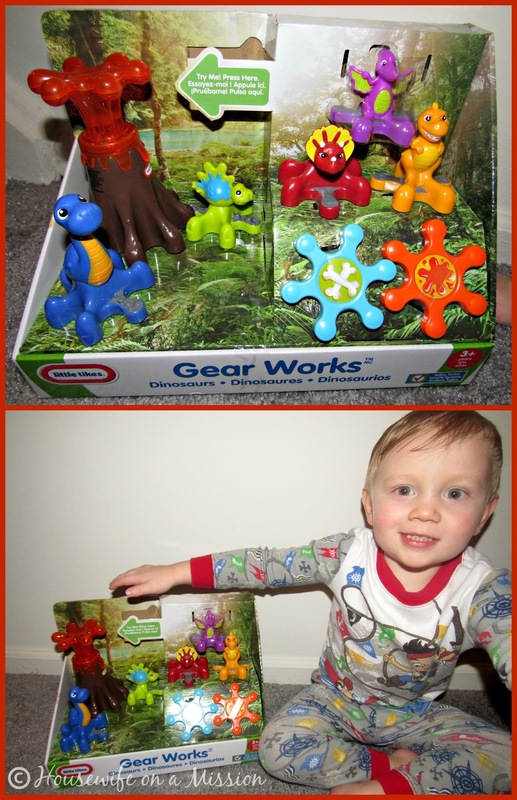 When I saw Little Tikes now has a Gear Works Dinosaur set, I knew it would be something that my son was going to love, and I was right! The Gear Works Dinosaurs is recommended for ages 3+, however my son turns 3 in May and I think this toy is something he would have loved playing with at 2 1/2+. This toy does not come with batteries. Once we place 3 AAA, my son quickly discovered pushing down the volcano plays fun music. If you push down the volcano again (lava), it will light up with lights. Connecting the gears to the volcano is very simple to do, you just slide them in to connect to the volcano-- they do not click in or fully connect. Once you have gears connected to the volcano, you push down the volcano which will then spin, and turn the gears. I have found that it works best with only connecting 2-3 gears, and noticed the volcano doesn't spin the best when all the gears are attached. Regardless, it doesn't seem to bother my son and he loves playing with it! We think this toy is fun to play with and recommend it! 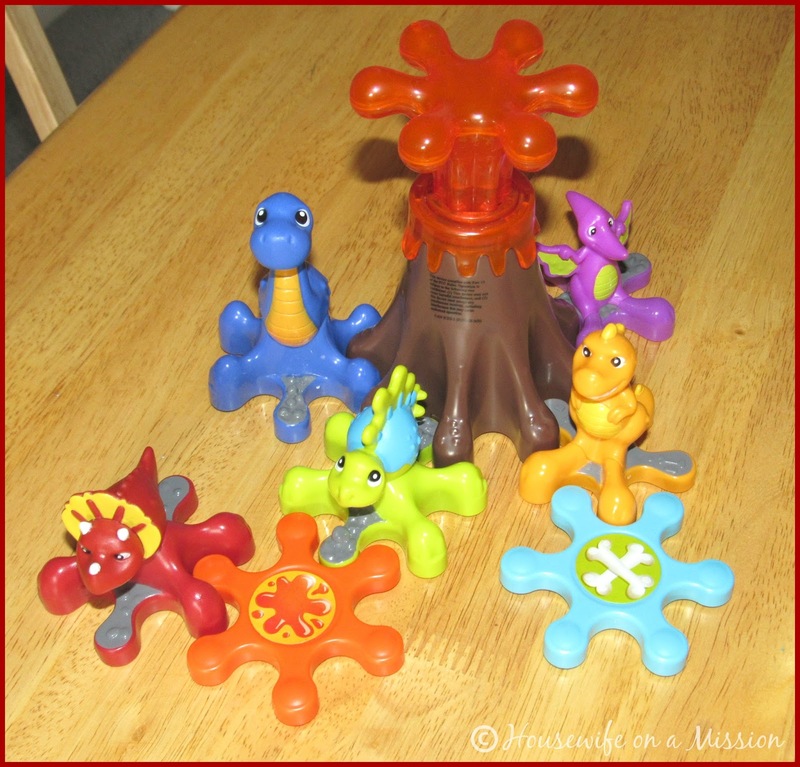 You can purchase the Gear Works Dinosaurs set on Little Tikes' online store for $24.99 or see where you can purchase this toy in a store (or online) near you. 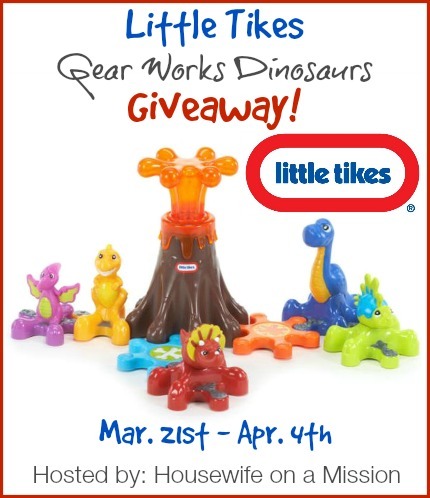 Win it: One of our readers are going to win a Little Tikes Gear Works Dinosaur set! Disclosure: Housewife on a Mission and IHeart-Motherhood is not responsible for prize fulfillment or shipment to giveaway winner. Winner will be drawn at random then emailed and will have 48 hours to respond to claim prize. If no response is given, another winner will be chosen. Facebook, Twitter, Pinterest, and any other social media are not affiliated with this giveaway. I would love to win this for my son who is obsessed with dinosaurs. I'd love to win this for my daughter, she loves playing with dinosaurs and her brother's tool bench with it's gears.